Prolific card blogger and avid Mets fan BA Benny recently ran a giveaway commemorating his 100th post. The (randomized) winner received a copy of Strat-O-Matic baseball, plus lots of favorite-team cards. Would you believe that lucky chap was me? Quite unexpected, but quite excellent! 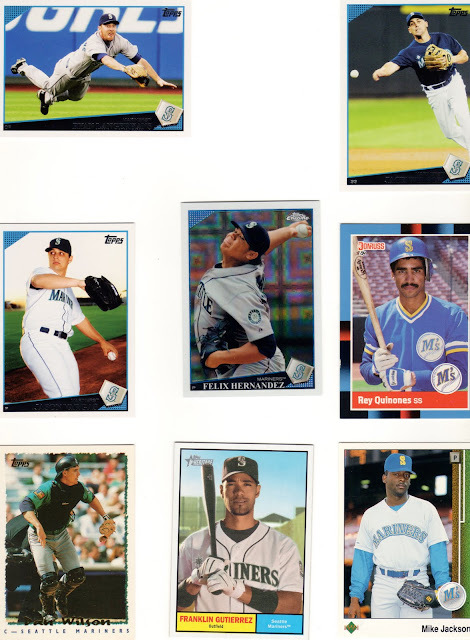 Check out this batch of cards from my Seattle Mariners, both old school and new, going clockwise from upper left. Ryan Langerhans: Saw him play for the A's a few years ago at Fenway, 1 of exactly 2 games he spent in Oakland green-and-gold. Jack Wilson: Current shortstop and seems to be decent at it. Rey Quinones: Mid-80s part-timer at shortstop. Once unavailable to pinch-hit because he was playing Nintendo in the clubhouse. Mike Jackson: Great reliever who made two turns with the M's, 5 years total in his 17-year career. Franklin Gutierrez: Great defensive CF, fast on the bases, and sharp hitter. Can't complain. Dan Wilson: Came to Seattle with Lou Piniella and solidified the backstop position for years. Jason Vargas: Quietly pitching very well for a last-place team. Thanks for all the goods, Mr. Benny! Read all about his cards at BA Benny's Baseball Card Buffet.